While browsing the apple movie trailers website, I happened on a fascinating preview for a feature length documentary on, you’ve guessed it, planet Earth. When I saw this film, I couldn’t help but remark on how timely such a piece could have come, and how conveniently it fits in with the recent content of this website. The film was actually completed in 2007 and, coincidentally, received its first cinematic release in the Netherlands. Of course, I wasn’t in the Netherlands in 2007, and now that it is 2009, it is no longer playing in cinemas here. Strangely, it was recently released in cinemas in the United States (April 22 – Earth Day) which would also explain why the trailer was on the apple website. There are two English versions of this documentary and the one I saw was narrated by Patrick Stewart, a.k.a. Jean Luc Picard, captain of the star ship Enterprise. The other version is narrated by James Earl Jones, and that is the version that was released in the US. Regardless, it cannot be understated how much of an impact a powerful voice can be on a nature documentary, as fans of David Attenborough can attest to. From start to finish, Stewart’s voice, like the voice of Saruman draws the viewer in and lends authority to all that is said. The story line is a simple one, the lives of several different animals are followed in the course of one calendar year, taking the viewer through the different seasons. The journey begins in the arctic with some baby polar bears (there’s nothing like footage of baby animals to make everyone go “awwww”). This differs from many older nature documentaries in that there is a sense of a storyline, albeit a weak one. However, nobody really goes to see a nature documentary for the storyline, and the photography is absolutely stunning. 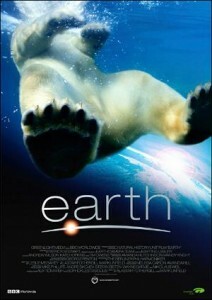 The footage, and indeed the film as a whole, is a compacted, film-length version of the television series “Planet Earth” and a large portion of the footage is shared. You could be forgiven for asking “why see this in cinemas?”. All the footage is filmed with the latest techniques and simply begs to be seen on a huge screen. Any and all photographers who are reading this review simply MUST see this film. The message is clear, the balance of the planet’s delicate ecosystems is being unbalanced. Many of the stories, in their own unique way, illustrate how the impacts of climate change affect their lives. In the same way that a picture is worth a thousand words, this film conveys in a way that a thousand essays never could just what is at stake, and what we stand to loose if we fail to act to protect our precious planet. From the magnificent panoramas, to the revealing time-lapse footage, to the super-slow-motion action shots, all the way to one particularly magnificent aerial shot of Angel falls in Venezuela, this film is one of the most visually stunning films I’ve seen in a long time. Patrick Stewart’s voice adds another dimension of beauty to this multi-layered cake of natural wonder. Although not a particularly challenging film in and of itself, the issues it raises with the preservation of our natural environment is the challenge of our generation. I loved it. I want to be on the film crew the next time they make one of these. Four stars.